Once past the winter solstice, days begin to slowly lengthen again….so for some of those still dark days, a few ideas and thoughts to brighten our spirits. Think about all those words thrown around about now…renew, redo, refresh, restore, refurbish, reclaim, re-invigorate…easily said, let’s explore some ways to make the words actually work for us. After the holiday flurry of activity, spend a quiet moment thinking about the new year and things you might want to get done, fix, grow, change or otherwise add to your home and life. This peaceful time could also be spent writing real notes to family and friends. It is such a delight to receive hand written paper notes…it can CHEER a very dull, gray day. The written words are most important but do find lovely notes or paper to contribute to the overall message you wish to communicate. It could be a ‘gratitude’ note or just a ‘hello, loved seeing you’ note! Sitting comfortably…Warm and cozy…create a nook or niche for relaxing…feel tucked in! MORNING…Something was striking the window! I awoke from a floating half-sleep and sat up to see that winds were blowing huge raindrops against the glass…stepping across the wood floor, I parted the lace curtain; cool morning light revealed a gray cloud over the garden. I found my slippers and a warm shawl and made my way down the hall to the kitchen…put water on to boil for the Chemex, grind the coffee beans…ummmm, French Roast, and let Holly out to the side yard. I put a towel in the dryer to get warm so I can wrap her and soak the raindrops from her fur when she comes back. REVITALIZE…Another topic for discussion at this time of year is eating healthy…as most of you know, I have been promoting healthy eating and organic foods for over 30 years! The recipe for a healthier life is pretty simple…possibly too simple…eat well and stay active! What does it mean to “eat well” ? Eat food that is real, not made or processed, food that has been around for many years such as vegetables, fruits, non-processed healthy meats, poultry and fish, nuts and whole grains…milk and yogurt if you can handle the dairy. Try to stay with non starchy green vegetables such as salad greens, broccoli, spinach, kale, avocado, red, green and yellow peppers and so on…fruits such as apples and berries…and, whole grains such as Ezekiel sprouted grain bread…you get the picture I’m sure! It is as simple as stay away from food not around 100 years ago, shop around the perimeter of the market…you’ll see. Of course I still drink my organic coffee and good wine…for the two best times of the day!! Indulge in warm, satisfying winter soups…chicken with carrots, onions, celery and spinach and whatever else you want to add to the soup. I love making soup during the cold days of winter, such a sublime way to end a day of working outside…sipping the warm broth makes my insides happy. Notice the cornbread? I make mine using organic stone ground corn meal and add flax-seed meal, my fresh eggs and local honey…usually I freeze any leftover cornbread, otherwise I’m tempted to have it for breakfast like my grandmother used to serve us… She would set a plate with a big square of warm cornbread slathered in butter and dripping with molasses in front of us at we sat down at the table. After breakfast clean-up we would run outside and get busy with chores…gathering eggs, milking the cows and separating the cream from the milk to make butter, stacking firewood to heat water in the big iron pot which would be used to wash clothes in the wash house, sweeping the barn and climbing on the hay bales…playing tag and hide-and-go-seek…until it was time to go inside for warm soup. I could smell the biscuits baking in the huge wood stove…and after dinner, it was time to curl up on the window seat with a good book for a while. While Mother Nature may have put the garden to sleep above ground…bring nature indoors with cyclamen, amaryllis and orchids….outside, add some tiny twinkling white lights to trees in the garden, for soon the hellebores, heather and Daphne will be ready for their early winter bloom and fragrance performance! 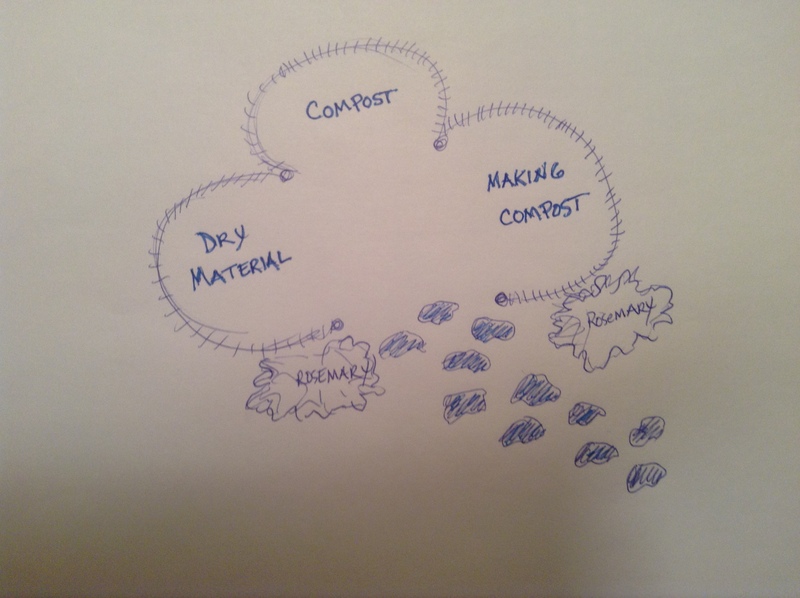 …turn the compost pile to encourage the process, you’re adding AIR, and if you see steam like your breath on a cold day, then lots of microbial activity is happening, it’s working! To make use 4-7 fence posts pounded into the ground with hog wire wrapped around and fastened to the posts…simple! Enjoy tea by the fireside with a few freshly baked scones…and that good book you found!